A Porsche 356 in the Cabriolet body style is a bit of a rare commodity in its own right, as it was never a huge seller for Porsche. Recently, the rising tide did indeed raise all boats, and the market discovered there is plenty of demand for all things Porsche – and well beyond just the legendary Speedsters. There is simply a finite supply of any 356’s, and today, even the least-loved examples are long gone out of used car territory. On a fabulous show field at the Amelia Island Concours, among dozens of fantastic 356 examples, this car proved to be far more of a celebrity than any other rare Porsche, and all because it wears the livery that Janis Joplin called “The History of the Universe.” It’s certainly why the 1964 Porsche 356 C 1600 SC cabriolet once owned by the singer-songwriter sold for many times its pre-sale estimate, hitting $1.76 million at RM/Sotheby’s 2015 sale in New York City. She might have sung about buying a Mercedes-Benz, but just like the song, her friends – and Janis – all drove Porsches. Even though many rock stars of the 1960s weren’t shy about spending big money on flashy cars, Joplin actually bought this gray 356 Cabriolet as a 4-year-old used car from Beverly Hills dealer Estes-Zipper for just $3,500. 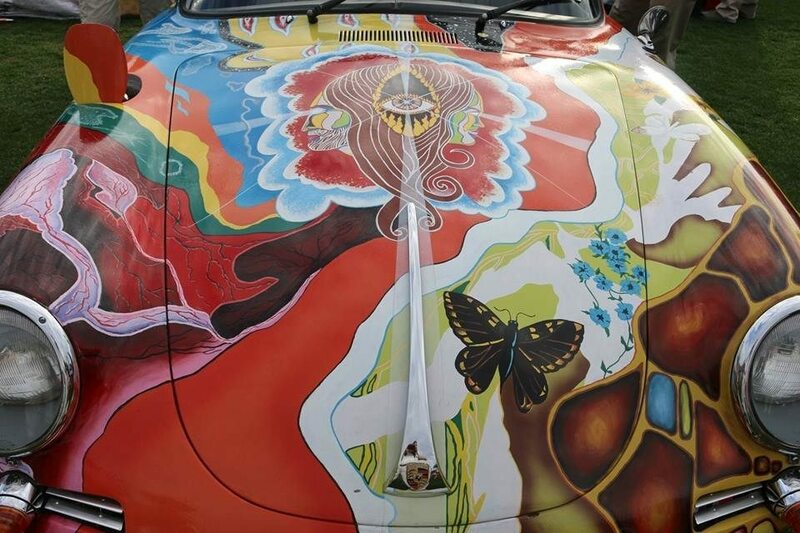 After some success, Joplin is said to have given her “roadie” Dave Richards $500 to decorate the car. Richards first put down a base coat of Candy Apple Red, and then used portraits of the band, places they had visited, and other motifs such as “The Eye of God” found on the hood to decorate the car. Also notable is a version of Joplin’s astrological sign, Capricorn, with the entirety of the finish protected by clear coat – a very wise move in hindsight, as the Porsche was at one point stolen, with the car thief realizing his mistake a little too late. The thief is said to have started repainting the car, though he didn’t finish the job — the car was recovered and returned to Joplin quickly enough, with Richards being able to remove the paint from the clear coat with little damage to the artwork underneath. 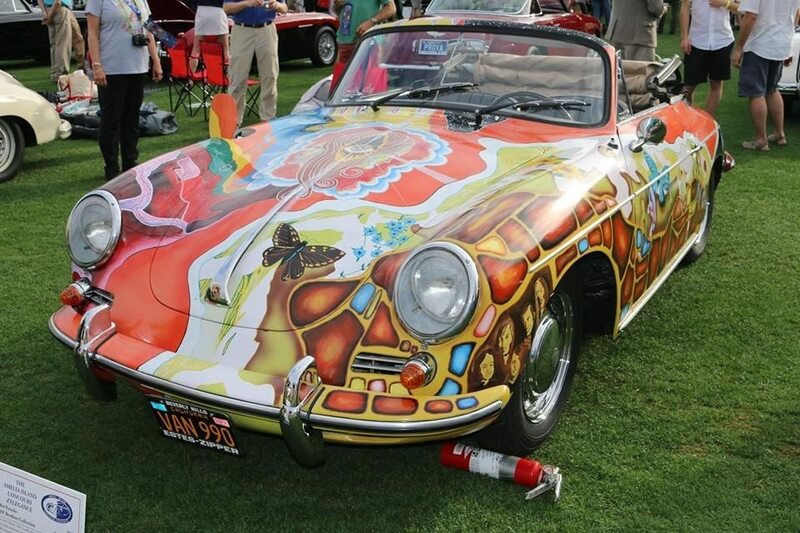 Joplin used the Porsche as her daily driver rather than using it as a stage prop, becoming a familiar sight in San Francisco at the tail end of the 1960s, and she continued driving the car through the breakup of Big Brother and through her years in Kozmic Blues Band and Full Tilt Boogie band. Immediately after Joplin’s death in 1970, her manager Albert Grossman retained the car, eventually returning it to Joplin’s brother and sister, who continued to drive it. Her brother Michael, living in Ohio at the time, rebuilt the original engine and later returned the car to its original dolphin gray finish. By the 1990s, a decision was made to replicate Richards’ artwork on the car, and luckily, there were plenty of photos of the artwork from the period. Artists Jana Mitchell and Amber Owen were able to re-create the original look from photographs. Since the re-creation of the artwork, the Porsche has been displayed in a number of museums, spending some time in the Rock and Roll Hall of Fame and Museum in Cleveland, Ohio, and also made an appearance at the Pebble Beach Concours d’Elegance and the Amelia Island Concours, where we photographed it. 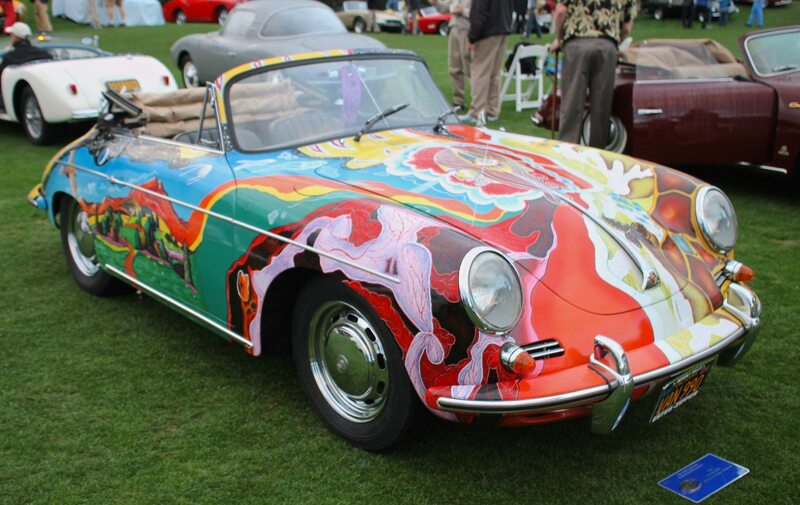 This car represents an interesting case study both in celebrity cars and art cars. We’re confident that many readers would agree that had the car maintained its dolphin gray paintwork from the ’70s, it would have been viewed differently at auction in the year 2015. The question is: Does the value of the car lie in Joplin’s original ownership rather than the artwork, or were bidders assigning a significant value to artwork reproduced decades later by different artists, however with some degree of accuracy? It’s still Joplin’s car — that’s what matters — and for bidders, the removal of the artwork in the 1970s and its return for museum display purposes perhaps only added to the car’s story. 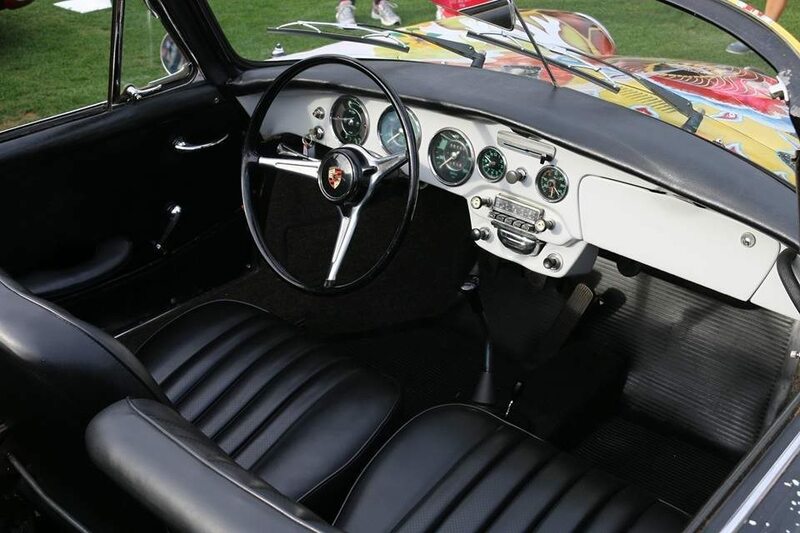 Traditional collecting says something is certainly lost when a car isn’t restored to factory specs and original color, but that was certainly not the case with this Porsche. If there were higher degrees of originality to be wished for here, it certainly didn’t seem to scare away bidders, as they spoke with their wallets as to the desirability of this artifact. 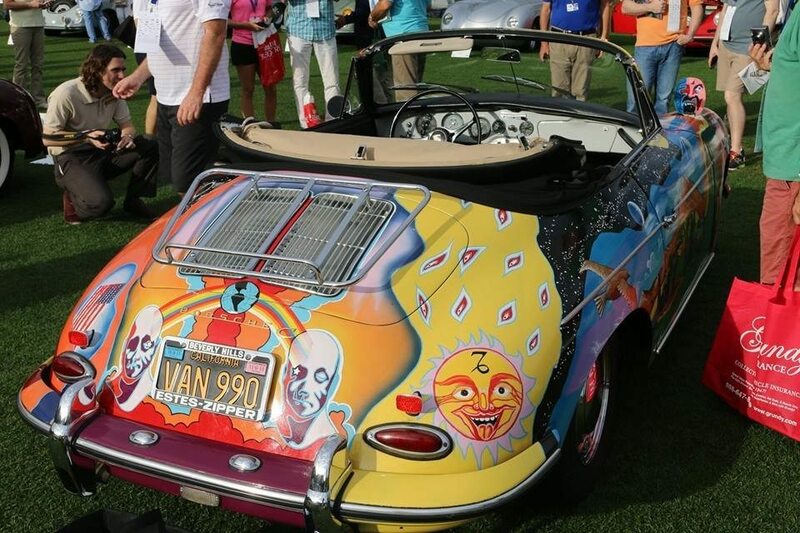 Part car, part cultural icon, and part history, maybe made all the cooler because for Janis, it was just her way to get around town.